After completing yesterday’s inaugural Collection Report post, I decided to see which player in my collection had the most cards without my posting a single scan of one on this blog. Much to my surprise, the answer was Lenny Dykstra. 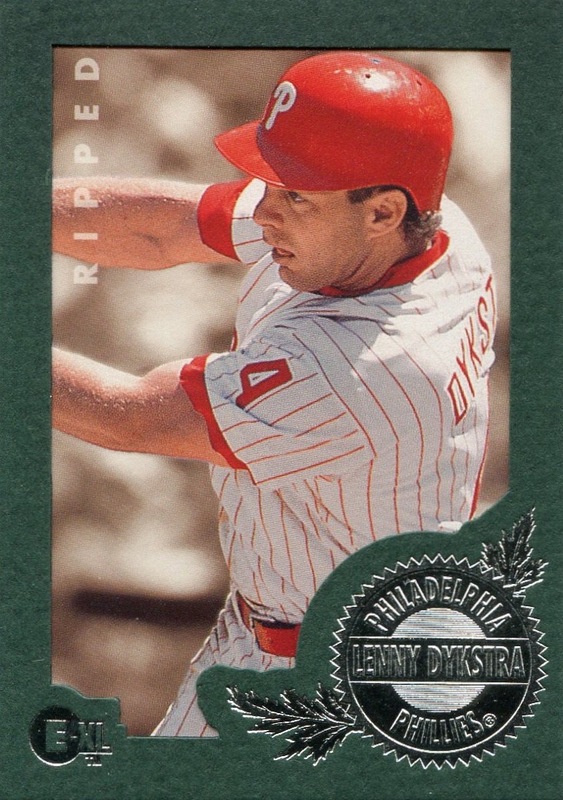 Seeing as there are only 11 Phillies in my collection with more cards*, I cannot fathom how exactly I made 621 posts to this blog without including a single Dykstra card, but it happened. Just an aside before discussing this report in detail, the “unique” cards category, not used in the Chuck Klein report, is an attempt to filter out multiple versions of the same card. It’s actually more nebulous than it sounds; parallels get filtered out, but I apply the “unique” label to cards that differ because of an autograph or embedded relic(s), but are otherwise identical to a more common “base” version. Furthermore, some parallels get the unique label because they actually contain a different photo or some other design element that gives them a dramatically different appearance — see the 1997 Fleer Ultra Gold Medallion parallels or the 2011 Topps Lineage 1975 Minis. Conversely, I consider some sets, like the Topps Tiffany sets from the ’80s, to actually be parallels even though they were marketed and sold as a separate, unique product. Yet, because the headache is just too great, I’ve made no effort to properly determine when various Topps/Bowman Chrome, Topps Opening Day and Topps Phillies Team sets reuse the same photo as the base set or bear a new photo. So, the term isn’t as precise as I would like, but it provides a somewhat clearer picture of the nature of the cards for a particular player in my collection. With that out of the way, a couple things jump out at me as I look at this report. First and foremost, is the relatively small number of relic cards. Taking a brief look over at what’s currently available over on COMC, the number easily could be higher. This is less true for the autograph cards, but that’s only because I don’t feel the need to go after the many different Donruss Recollection Collection autographs — although, it might be nice to have one such 1992 card, only because I have quite a few from that set already. The other item that jumps out is the complete lack of graded cards. Of the 28 Phillies with the most cards in my collection, only one other does not have a graded card. I don’t feel any particular need to acquire any such cards for Dykstra. Though I suppose that if I could add one for just a couple bucks and I was in the right mood, I might do so. A few other items to share. First, all the Dysktra cards on my want list incredibly low priority. 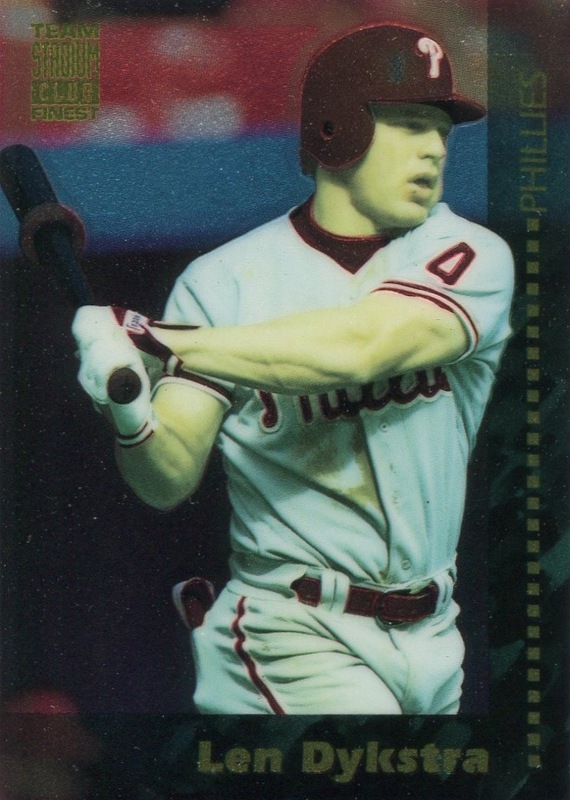 In fact, the only card that sticks out as something I’d like to obtain sooner than later is probably his 1994 Stadium Club Finest insert, which is a card a already have. It’s on my want list only because I want to replace it — my copy is a victim of the dreaded color fade that affects so many Chrome and Finest cards throughout the ’90s. That is, if I can find a replacement I would be happy with — a rant for another day. 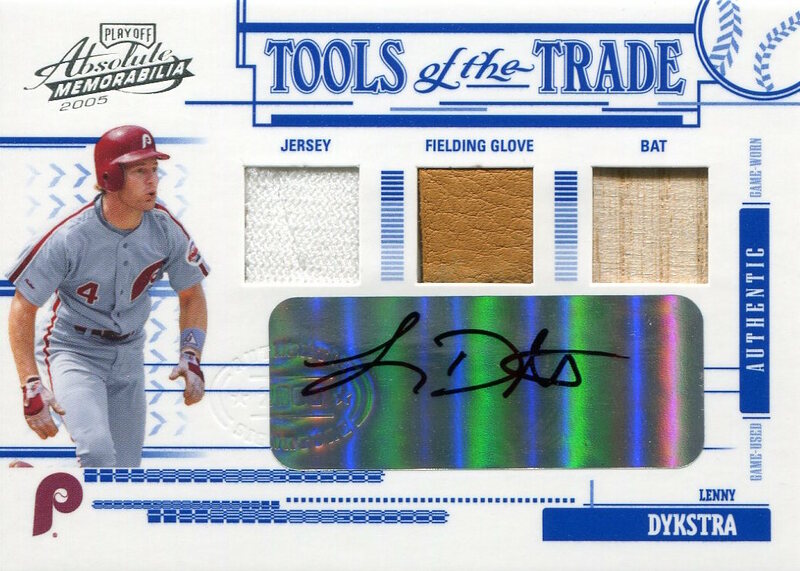 As for the cards in my collection, I harbor no doubts when declaring the 2005 Playoff Absolute Memorabilia Tools of the Trade autograph-triple relic card as my favorite; the fact that it uses a photo of Dykstra wearing the ’70s-’80s jersey just makes it that much more awesome. It’s a candidate for possible professional grading, but there are plenty of other cards in my collection higher on the priority list. Moving forward, I plan on one Collection Report per week — that is, when I’m not on some hiatus, announced or otherwise. As always, requests in the comment section are welcome. * I’m reasonably certain that most well-informed Phillies collectors could quickly name at least 10 of them. The 11th player might be a little tricky, but shouldn’t be too big a surprise.